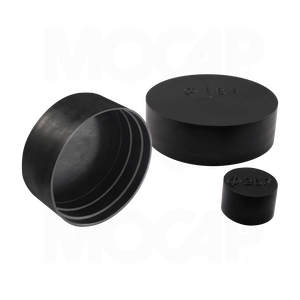 MOCAP Pipe Caps are designed to fit many different styles and sizes of threaded pipe ends, allowing for maximum flexibility. Designed to secure Metric, BSP and NPT threads from damage and contamination during transit, handling and storage, our PC series Pipe Caps are easy to install and remove. Our PC Series Caps are moulded in Black polyethylene plastic and sized to fit 1/4 thru 16 NPT or 1/8 thru 16 BSP or 8mm thru 406.4mm Threads. Pipe Cap sizes to fit 18 thru 40 NPT or 18 thru 40 BSP or 457.2mm thru 1016mm threads are also available, but not as stock items. Many Sizes of Our Pipe Caps are Stocked for Immediate Shipment.